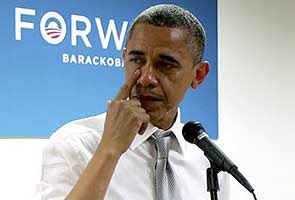 U.S president Barack Obama Cried while talking to his Campaign staff after he was re-elected as US president. Obama visited his campaign headquarters before returning to Washington, the day after his re-election victory. He told the assembled staff, most of whom were young people in their 20s and 30s, that their work organizing his vast ground operation reminded him of his time as a community organizer in Chicago when he was their age. "What you guys have done, means the work that I am doing is important, I am really proud of that, I am really proud of all of you," Barack Obama said before pausing as tears welled up and dampened his cheek. Watch below the video showing the Obama's speech with Tears. It is very Rare scene. Because, normally Obama is a cool guy who won't show any emotion in public.